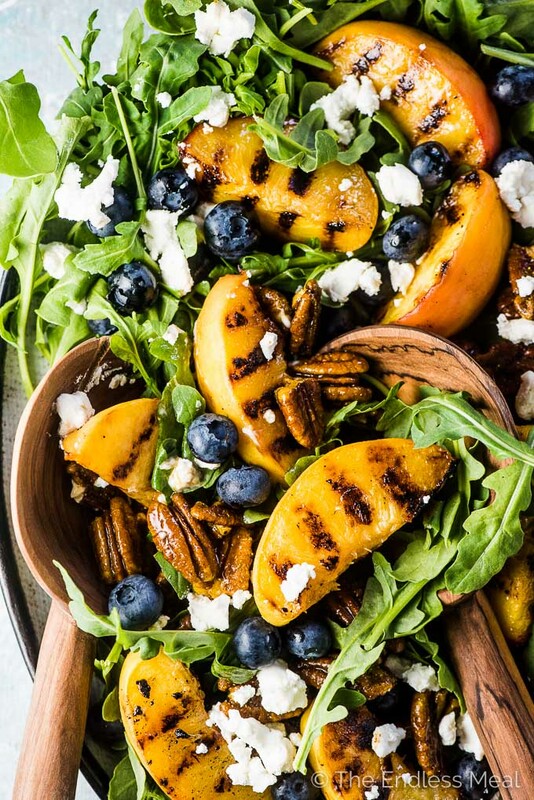 Grilled Peach Salad is the ultimate summer side dish recipe. 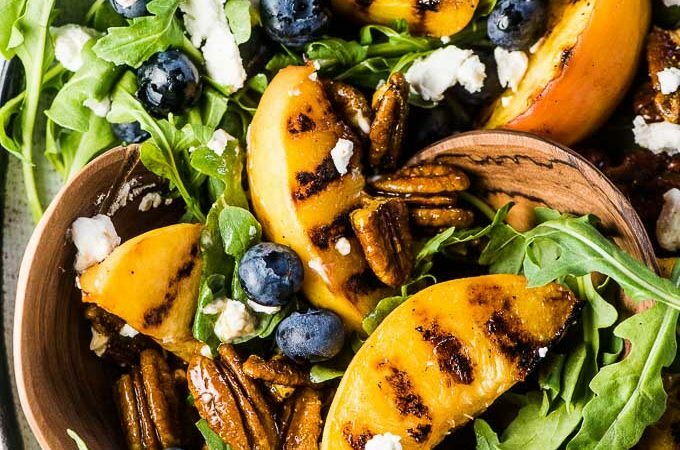 The peaches are grilled until smoky and extra sweet and served with arugula, blueberries, candied curry pecans, and a honey vinaigrette. 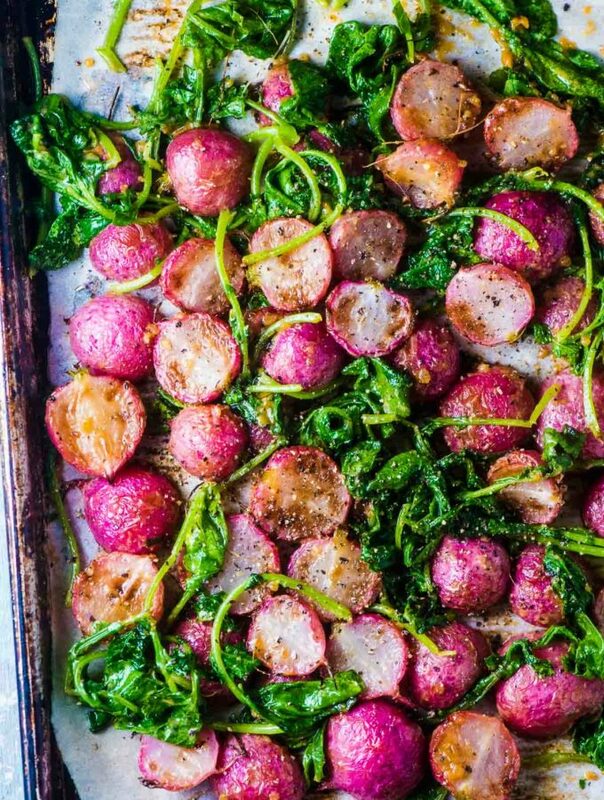 Add some goat cheese or (paleo-friendly!) diced avocado and you've just made the best grilled salad ever. Grilled Peach Salad – my new favorite summer salad recipe! It's sweet. It's summery. It's a little bit strange → I'm looking at you candied curry pecans. And it makes all things right in this world. You can't get enough sweet peaches. You think nothing can beat a juicy, fresh peach but have an open mind and like to try new things. TRUST. You should do this. You're all about maximizing summer cooking while you can. Bring on the BBQ! You know that a salad isn't a salad without something sweet in it. Warning: don't give in and try one of those grilled peaches before you put them in the salad. If you do, chances are you won't be able to stop yourself from eating all of them! 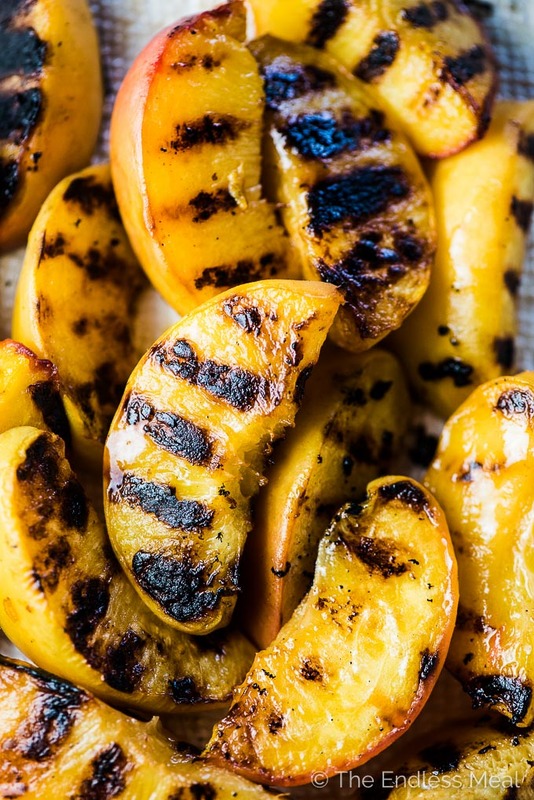 Grilled peaches are literally the simplest things ever to make. Grill the peaches for a few minutes on each side. There is one thing that will make your peach grilling life even easier: Grill Matts. 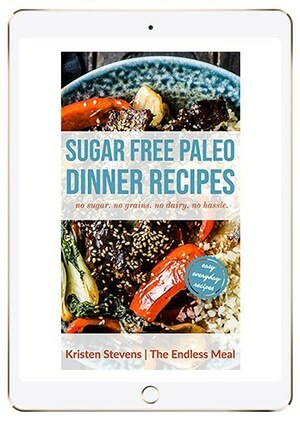 (← affiliate link) Have you heard of them? Do you have one? On a visit home this summer my mom was raving about hers. I bought one the next day and now tell everyone I know how awesome they are. Nothing sticks to them and your BBQ stays CLEAN! You can definitely make this grilled peach salad without a grill matt but you'll want to make sure that your grill is well oiled before putting on the peaches. That's what those little nuggets of joy up there should be called. They're sweetened with honey, have a gentle curry flavor and are begging to be eaten with smoky grilled peaches. Making candied pecans might sound a little difficult, but it's super easy. 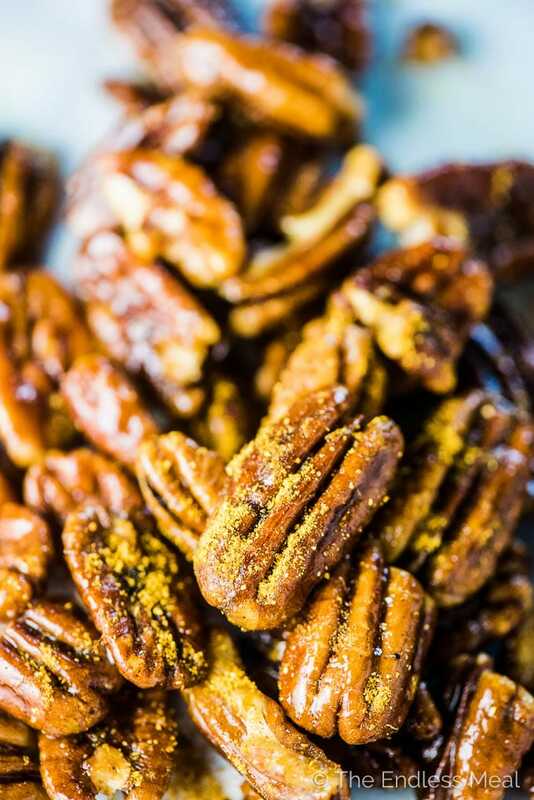 → Put the pecans in a pan with some honey, curry powder, and salt and let the honey boil until the pan is dry and the pecans are coated in a sweet glaze. → Stir some butter through the pecans so they don't stick together and you're done. See how easy it is to make the best grilled peach salad topper? Now all you need is to shake the honey vinaigrette ingredients in a little glass jar (like a 1-cup mason jar) and you are set. Pour the dressing over the salad, toss, and eat! Grilled Peach Salad is the ultimate summer side dish recipe. 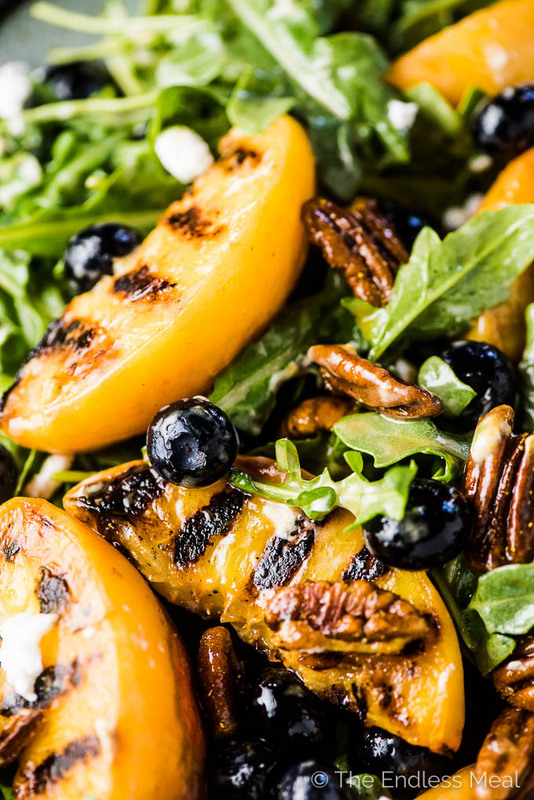 The peaches are grilled until smoky and extra sweet and served with arugula, blueberries, candied curry pecans, and a honey vinaigrette. Add some goat cheese or (paleo-friendly!) diced avocado and you've just made the best salad ever. Place all the vinaigrette ingredients into a 1 cup mason jar and shake until mixed. Preheat your BBQ to high. Cut the peaches in half and remove the seeds. Then cut each peach half into three wedges. Place the peaches in a medium-sized bowl and toss with the oil. Grill the peaches for 2-3 minutes per side. 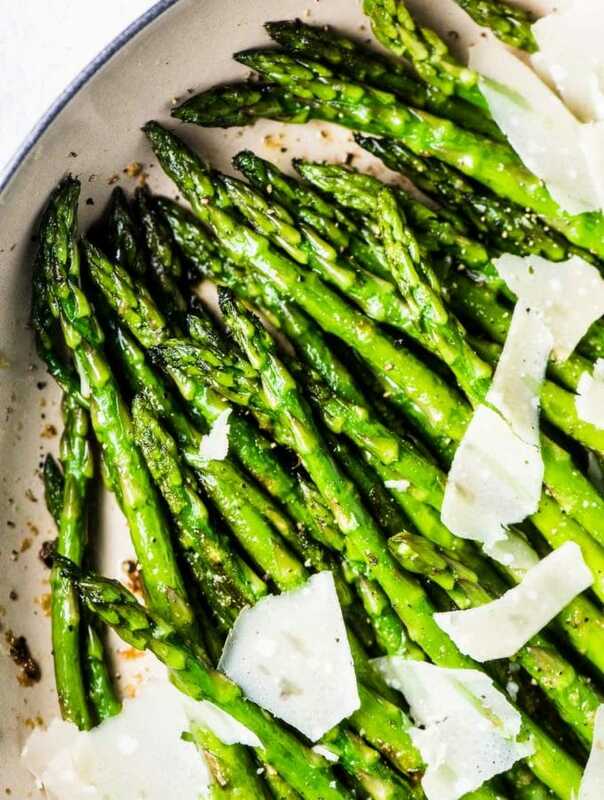 Remove them from the grill using an offset spatula – I find this works better than a regular spatula and helps prevent the grill marks from being left on the grill. 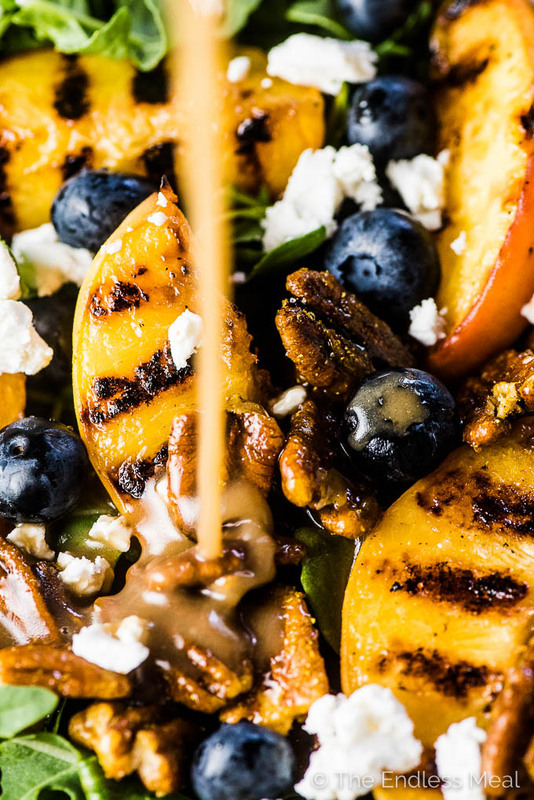 Place the arugula in a large bowl with the goat cheese, curry pecans, blueberries, and grilled peaches. Toss with the dressing and serve immediately. A grill matt works really great for this recipe. If you don't have one, make sure to oil the grill well so you don't risk the peaches sticking. This recipe is incredible! I added a little bacon cause I had some in my fridge that I needed to use but other than that made the recipe exactly as you’ve written it. I will be making this again! Such a great idea to add bacon!! Would feta be an OK alternative to the goat cheese? I will eat almost anything in this world, but I really hate the taste of goat cheese. Thanks for sharing this recipe! um WOW those photos are gorgeous. I’m just staring at them and staring at them! Beautiful work!